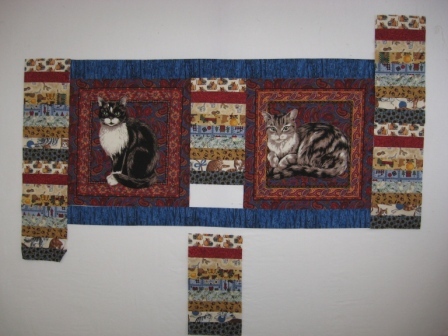 I have done a cat quilt that has been donated to the Edmonton Humane Society. 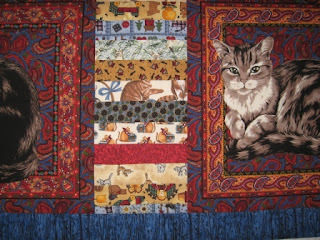 The Edmonton District Quilter's Guild is doing a couple of committee service quilts this year and the humane society is just one group. They have asked for some different sizes that can be used in the cat and dog rooms. 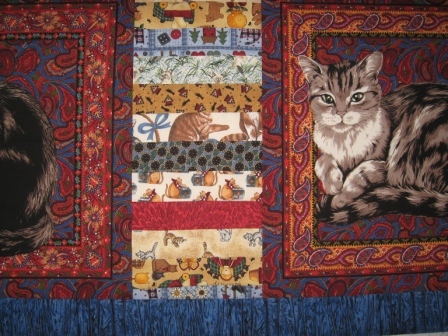 One size for cats was 20" by 51" like this quilt. I think it was for a window sill. A detail of the fabrics I used. I tried to use many Cat prints and had to add a few others that just went well. I had these two cat panels to start me off. I think most of this fabric is 10 years old or older. I have many Debbie Mum prints as she used cats in many of her prints.